Really lovely place. A hot summer but cooler there because of the river and shade . Lovely garden and pool for kids to play-plus a trampoline! Great food and very entertaining Mexican dance in the evening. Really friendly staff. Lots of stuff in the area to see. The staff has been so friendly and they did everything to make us feel at home. For the entire staying, I had the feeling I was visiting my friends. As for the property itself, room, food and facilities, it totally exceeded my expectations. I will definitely come back to La Maison Templiere! This was a very nice one night stay with two other couples: Very friendly host and staff! 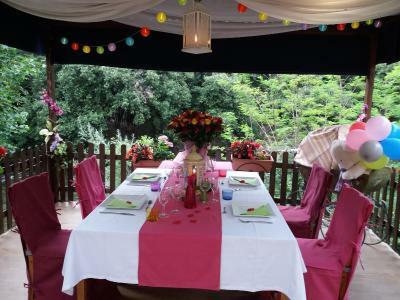 Loved the fun and vibrant decor in the dining room and fun garden landscape. Children would find it absolutely magical. The performance of the mexican dancers made the big difference. Family atmosphere, no fuss, simplicity but good taste. Not for persons who want perfection, but for the ones who appreciate a detensed atmosphere. Our room was beautiful, very nicely decorated, comfortable and spacious. Beautiful setting and nice gardens. Very quiet and had two very restful nights here. Friendly, warm and a relaxed staff that was willing to do every1thing for you. The buffet in the night was absolutely delicious. They did their best to variate every night. We stayed for 6 nights and every night they managed to serve a healthy buffet with enough variaty. Everything was homemade and a lot came from their own garden. The entertainment group performed for us every night and we enjoyed this very much. We added a photo from 2 professional dancers from Mexico. The staff was really sweet to our dog and we felt very welcome. A big thank you for everything and we will be back at Christmas. 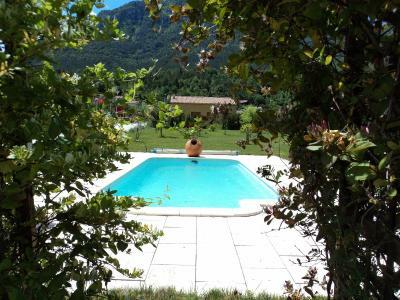 La Maison Templiere is located in Belvaines-et-Cavirac, in the Aude Valley between Toulouse and Perpignan. It offers spacious accommodations with an outdoor swimming pool, hot tub and spa. Each room at the Templiere Maision is individually decorated and has a private bathroom and a view of the surrounding Fanges Forest. Some rooms also have free Wi-Fi access. The Templiere’s restaurant serves traditional cuisine and guests can relax in the garden and on the sun terrace. La Maison Templiere’s staff are available to organize visits to Cathar and Templar Castles including Carcassonne, Queribus and Peyrepertuse. There are also a number of activities in the area such as rafting, canoeing and canyoning. Free private parking is available at La Maison Templiere and it is an hour’s drive from the Mediterranean coast. When would you like to stay at La Maison Templiere? This room features a view of the surrounding area. It has a private bathroom and free toiletries. House Rules La Maison Templiere takes special requests – add in the next step! La Maison Templiere accepts these cards and reserves the right to temporarily hold an amount prior to arrival. We loved the Mexican Dancing entertainment. The pool is a little small but adequate. Quiet area and not many folks about so drove to the local town Quillan for dinner.